This is archived information showing sites that have been gracious enough to allow us to use them in previous Doors Open Clarington events. The reason for this page is to demonstrate to the visitors of this website, of the generosity of the Municipality of Clarington, along with local business owners, corporations and private citizens in years past. We encourage you to show your appreciation with continued patronage of them and their services in thanks. These sites WILL NOT be a part of Doors Open Clarington 2018. 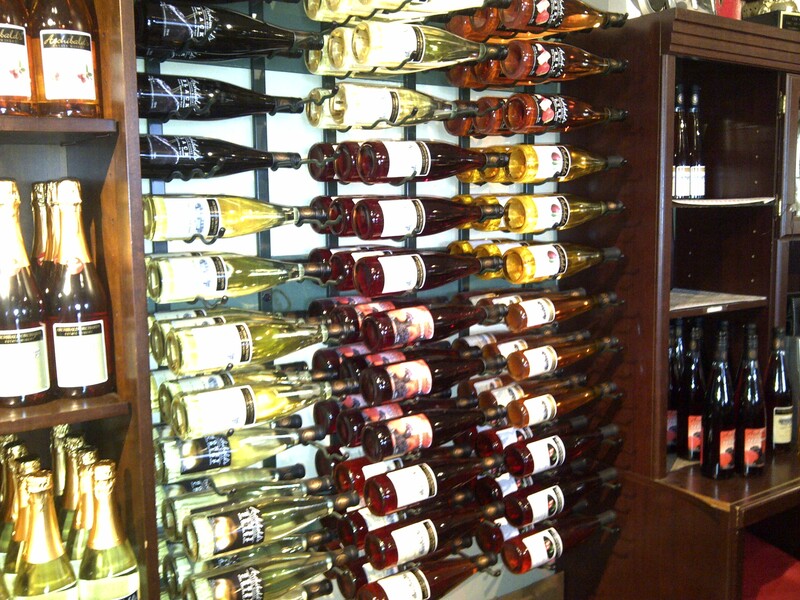 Archibald’s Orchards & Estate Winery (2013) – Archibald Orchards & Estate Winery and Cider House Golf is a fourth-generation family farm business with roots in the Niagara fruit belt. Owners Fred and Sandy welcome guests to their unique facility, established in 1967 as a wholesale operation. A wine-bottling tour and guest artisans from the area were the highlights of this event. Bethesda Cemetery (2013) – This cemetery started out as the Werry family cemetery in 1848. A church was established and the cemetery expanded. The chapel, which is 50 years old this year, has a stained-glass window donated by Ewart McLaughlin that can be viewed only from the inside. There was a guided tour of the cemetery. Dr. Hillier’s Home (2013) – Dr. William Hillier, who lived here in the late 1800s, was widely known as a skilled physician and surgeon. Other doctors frequently consulted him about critical cases. 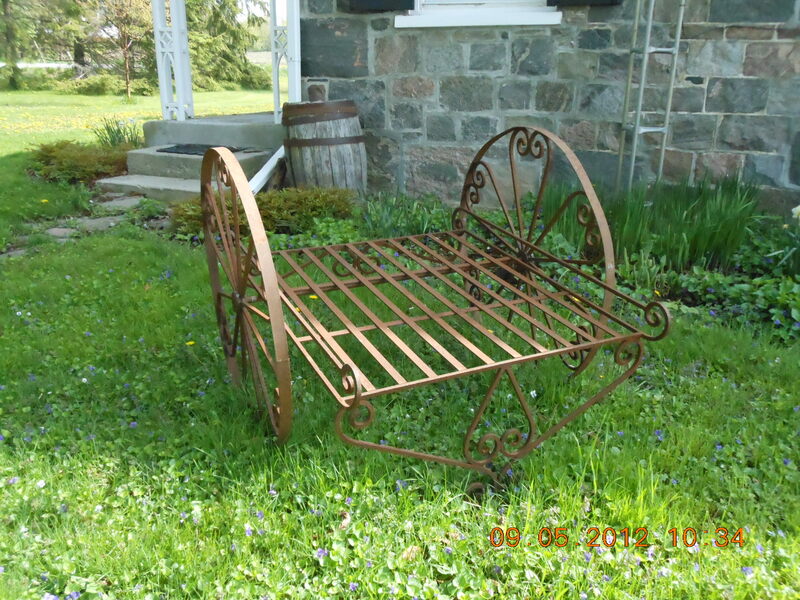 The present owners’ cottage industry, Timeless Essentials, features herbs and garden products. There were displays and re-enactments illustrating the history of herbal medicine. Former Carriage House Hotel (2013) – Now the home of Frank and Catherine Simpson, this beautifully renovated home was once a hotel in Tyrone. Haydon Community Hall (2013) – Haydon Public School, which was built in 1876 and closed in 1965, is the oldest rural school still standing in Clarington. The building is now used as a community hall. Many of the original features of the school, including the wall-to-wall slate blackboard, still exist. Demonstrations of quill pen writing was just one of the many highlights. McLaughlin Home (2013) – Robert McLaughlin built this house with his own hands around 1864 for his wife. Made of boards, not logs, it was to be a better house than the McLaughlins had in Tyrone. One of their three sons, Robert Samuel, better known as Colonel Sam, was born in 1871 in this very house. 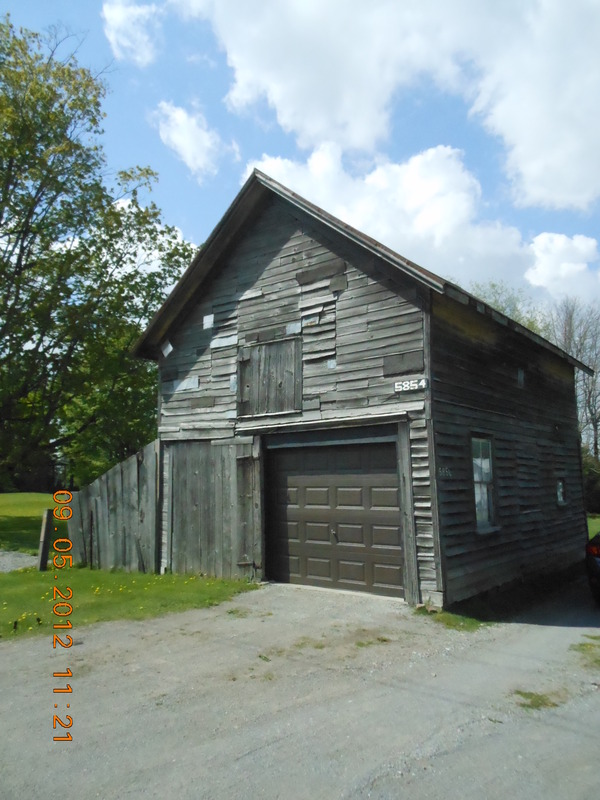 McLaughlin Shed (2013) – Constructed in 1869, this shed is all that remains in the village that recalls the McLaughlin Carriage Company. Robert McLaughlin moved from the family farm, in Tyrone, to start his business here. 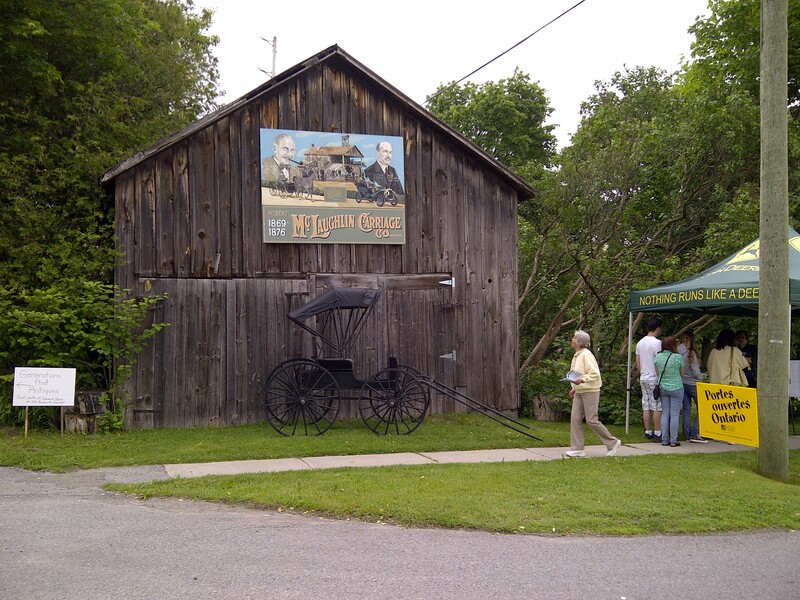 The McLaughlins manufactured cutters, wagons and carriages in the village until 1876, when the company moved to Oshawa. Local artist Russ Gordon painted the sign in 2003. Russ Gordon’s Art Studio, Home and Gardens (2013) – This century home is the studio of artist Russ Gordon. Since 1978, he has been a custom automotive painter. He also paints large-scale murals (indoor and outdoor), one of which is on the McLaughlin Shed in Enniskillen, as well as portraits, landscapes and goalie masks and hockey art for the NHL Alumni. Russ is also a musician of local renown. 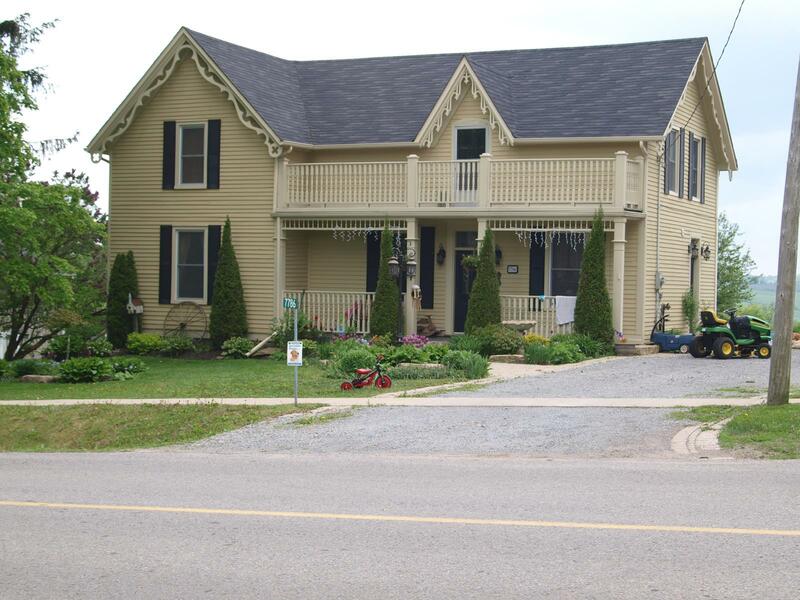 Sylvester Home and United Church Manse (2013) – Richard Sylvester owned this home, the Sylvester Agricultural Works and McLeod Store/Foundry across the road. Fire damage in Enniskillen in 1881 drove the company to move to Lindsay. Later, the United Church owned the house and used it as a manse. For Doors Open, enjoyed the work of a local artist and musical soloist, as well as various historical displays. Tyrone Community Foundation Garden (2013) – The Tyrone United Church shares this site. 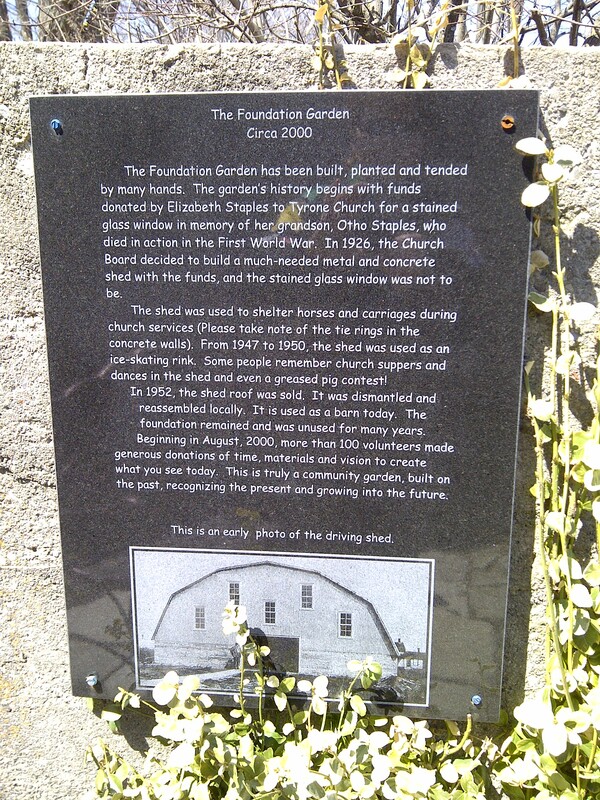 The shed was built to shelter horses and carriages during church services. The building was used for dances, church suppers and a skating rink. The roof was taken down and reused in another location. In 2000, more than 100 volunteers donated their time, materials and vision to create the garden you see today. Tyrone Mills (2010, 2013) – Tyrone Mills, built in 1846 by James McFeeters and John Gray, is a site well known for its flour milling. Little has changed in the mill’s interior over the past 150 years. A woodshop, blacksmith shop and an outdoor wood-fired Quebec oven have been added to enhance the mill. Demonstrations and displays were featured during both Doors Open events. Tyrone Community Orange Hall (2013) – The Sons of Temperance built this hall about 1880. The Loyal Orange Lodges have existed in Tyrone since 1855. 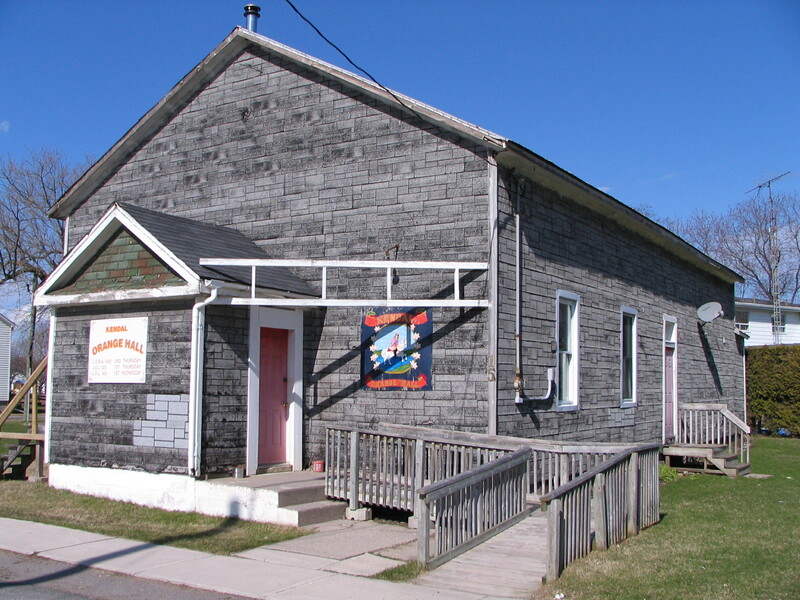 Today, the Tyrone Orange Community Hall Board owns and operates the hall. Clubs and historical information were on display, and Irish stew, dessert, coffee and tea were available to purchase. 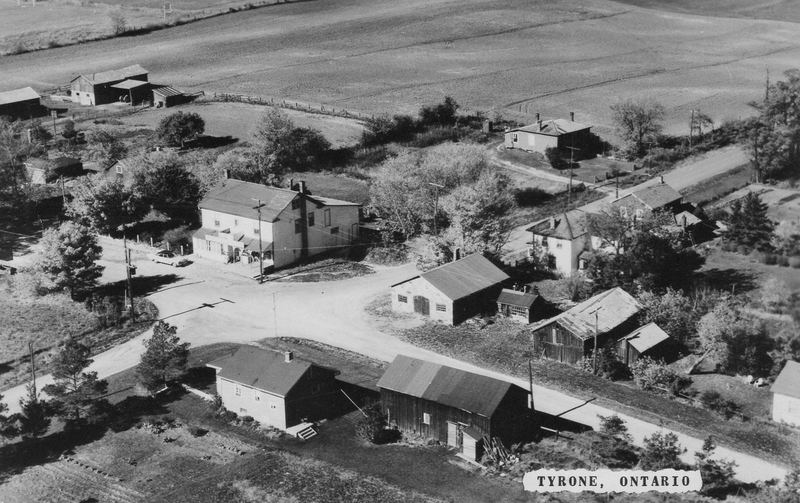 Tyrone Self-guided Walking Tour (2013) – Tyrone village has the most historical structures – commercial, institutional and residential – of any village in Durham. Back in the late 1800s, some of these buildings functioned as a schoolhouse, a Bible Christian church, a hotel and a blacksmith shop. A self-guided walking tour of the east side of the village included some gardens. The tour began from the Tyrone United Church. Walnut Grange (2013) – Walnut Grange has been farmed by the William Clemens family since 1855. William’s son Stephen built the home in 1889. The main floor of the house will be open and an antique tractor collection was displayed on the lawn. 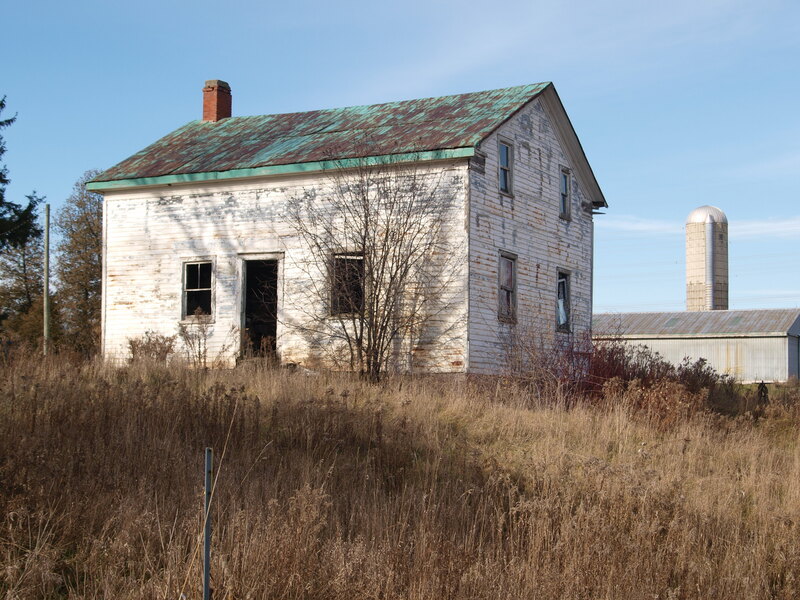 Benjamin Lett’s Homestead (2012) – Born in Kilkenny, Ireland, Benjamin Lett emigrated to Canada with his family originally settling in Quebec. By 1833, the Lett family had taken up farming in this small white house in Darlington Township. Known as the ‘Rob Roy of Canada’, he was celebrated as a patriot to some and a rebel to others. He did not fight in the 1837 Rebellion; however, he was attributed with many terrorism acts in carrying on the rebellion against the hated British establishment. As an ardent supporter of William Lyon Mackenzie, Lett operated for a number of years in guerrilla warfare along the Niagara border. He became a legendary figure and was described as a “fearless vengeful patriot” armed with pistols and a bowie knife. While charges remain unproven in court, Lett has been attributed with the assassination of British Captain Edgworth Ussher who was an key figure in the destruction of the American vessel Caroline . Most famously, Lett is blamed for the bombing of General Brock’s monument in Queenston. This monument, a symbol of British power and prestige, was shattered early in the morning on Good Friday 1840. Following the explosion, Lett returned to his family home in Darlington Township to hide from the British troops. His mother, who still resided in this house, hid him under a trapdoor with a rug and sofa placed over the trapdoor to conceal its presence. Lett escaped to the United States where he continued his guerrilla warfare only to be captured in 1841. In 1845, he was released from prison due to poor health most likely as a result of poor treatment by his captors. By that time, the family had relocated to a farm in Illinois and Benjamin Lett joined them there. In 1858, he succumbed to strychnine poisoning which his remaining family members blamed on Tory agents. He is buried in the Lett Cemetery in Northville, Illinois. The Lett Homestead is an excellent example of an early pioneer home. The accordion lath on the ceiling of the downstair’s rooms is an example of early carpentry skills used during the late 1700’s and into the early 1800’s. 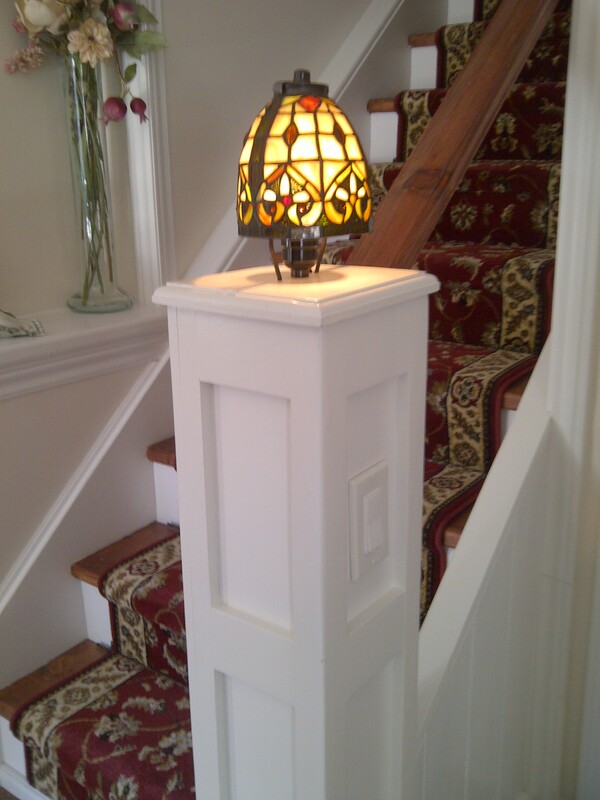 The narrow staircase to the upstairs and trim around the doors and floors are all orginal to the home. 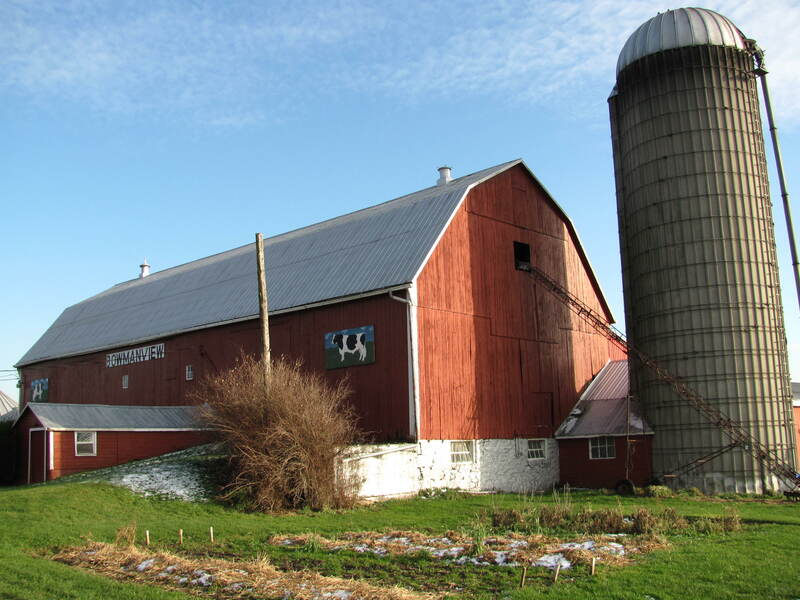 Bowman Barns at Bomanview Farms (2012) – This continuously active farm circa 1855, has been in the Bowman family since 1929. Four generations of Bowman family have farmed the land currently known as Bowmanview Farms. The exteriors on all outbuildings are original but there have been modifications to the interiors of the barns for farm operation. The old wood shed on the house was moved to its current location in 1891 when they put an addition on the house. Even with upgrading, the family has strived to maintain the heritage of this farm. A notable feature on the farm is a beautiful arch-framed barn. This unique piece of architecture does not contain any cross beams in the interior of the barn which is especially evident at this time of year when it is empty of hay. The barn was re-built in 1942 after it mysteriously burned to the ground. It was built upon the original stone foundation from the early 1800’s. Today on the property is “Gallery on the Farm”, featuring original works of art from Eric Bowman in addition to handicrafts from local artisans. The farm also sells orgnaic farm produce. Breeds of rare livestock graze the fields reminding us of our pioneer heritage. 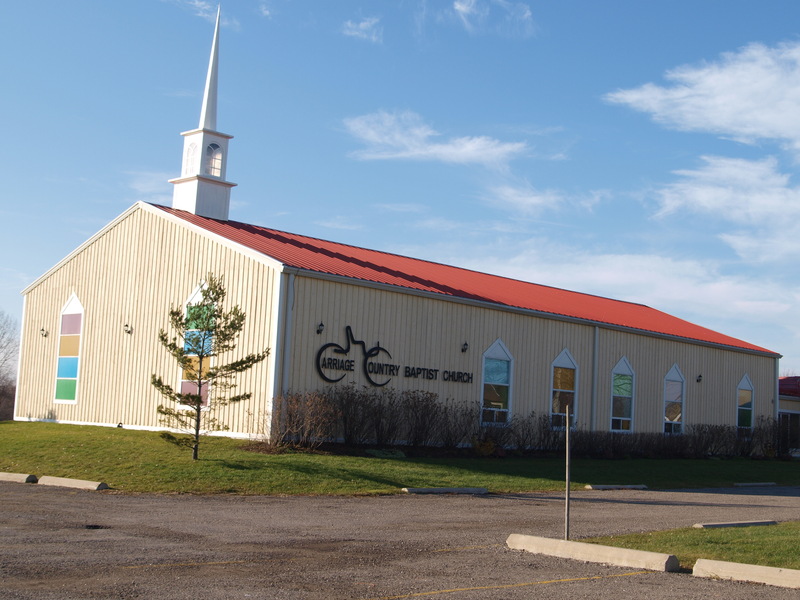 Carriage Country Baptist Church (2012) – The Carriage Country Baptist Church began Sunday Services on April 16, 2000 in the Tyrone Community Centre. 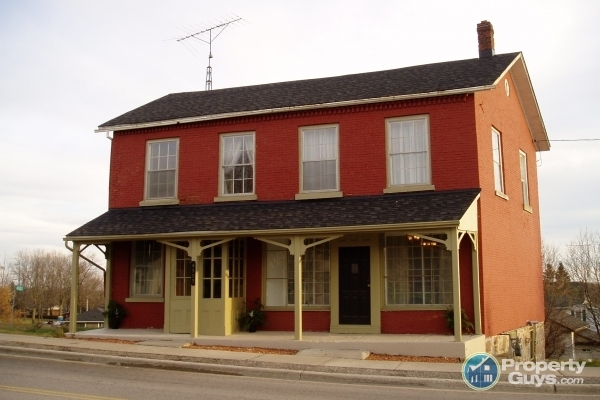 Named to recognize the history of carriage building in this area by the Sam McLaughlin family, the congregation purchased the Mitchell’s Corners Public School on November 30, 2001. A new building was added onto the existing school in order to facilitate the needs of the congregation in their permanent home. There has been a school in Mitchell’s Corners since 1861. The current building was constructed in 1954 and was heralded by officials and community members for its two modern and attractive classrooms. By 1961, with increasing enrollment, an addition was built onto the school that would double its size to four classrooms. Unfortunately, declining enrollment took its toll and in 2001, the Kawartha Pine Ridge District School Board voted to close this school. Today, the Carriage Country Baptist Church offers a fine example of adaptive re-use of a building. Once a school, this building continues to thrive within the community as a place of worship. One of the features here is a piece of history that helped them pick the name for the church. They researched local history and wanted to draw attention to the carriage works, the McLaughlin family and General Motors of Canada history so bought a carriage that although is not a McLaughlin was owned by a local country Doctor in the area. Eldad United Church (2012) – Eldad United Church is a hub of activity for the community of Solina. Built in 1855, this church replaced a smaller wooden one. The basement and a porch were added in 1928, and 12 stained-glass memorial windows, a domed ceiling of dark birch panels, new hardwood floors and new dark oak pews were among the 1948 renovations. Many of the village’s groups meet at the Church throughout the week. One of these groups is the United Church Women (UCW). The UCW of Eldad United Church was established in 1962 with the encouragement of Rev. Fred Reid’s wife Anne. Rev. Reid was the minister at the time. In 2012, the UCW at Eldad celebrated 50 years of community, church and world mission contributions. This active group of women recently recognized 8 of the original 17 charter members who still come out to monthly meetings, take part in worship and programming, and play the significant role of serving others. Many of these ladies have direct family ties to the pioneer families who settled the Solina area. The ladies honoured included Doreen Westlake, Marion Broome, Doris Hills, Mary Millson, Lois Yellowlees, Jessie Tink, Loraine Knox, and Joyce Taylor. The impressive history of Eldad and groups like the UCW was featured along with a self-guided tour of the beautiful stained glass windows dedicated in the name of different pioneer families significant in the life of the church, which decorate the intimate sanctuary. Enfield United Church (2012) – Enfield United Church was constructed in 1877 as a Methodist Episcopal Church and became part of the United Church of Canada at church union in 1925. A painted inscription above the front door reads “M.E.C. A.D. 1877”. The building is typical of small rural churches built in Darlington Township during the late nineteenth century. Frame churches were more commonly built than brick because they could be erected cheaply, but very few survive in good condition. Enfield United Church remains relatively unchanged, with its original glazing and clapboard siding still intact. It is considered to be the best surviving example of a small frame rural church in the former Darlington Township. The church played host to an intimate concert performed by famous Jazz pianist Oscar Petersen. One of his daughters was marrying a local man, and he performed at her shower. The church is the last public building that remains in the village. 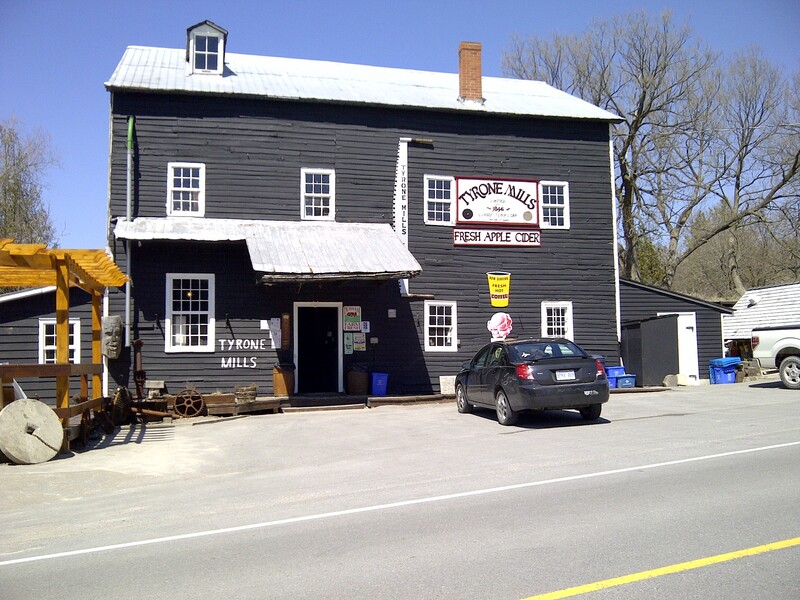 Enfield once had a school and general store neither of which still stand as they were. 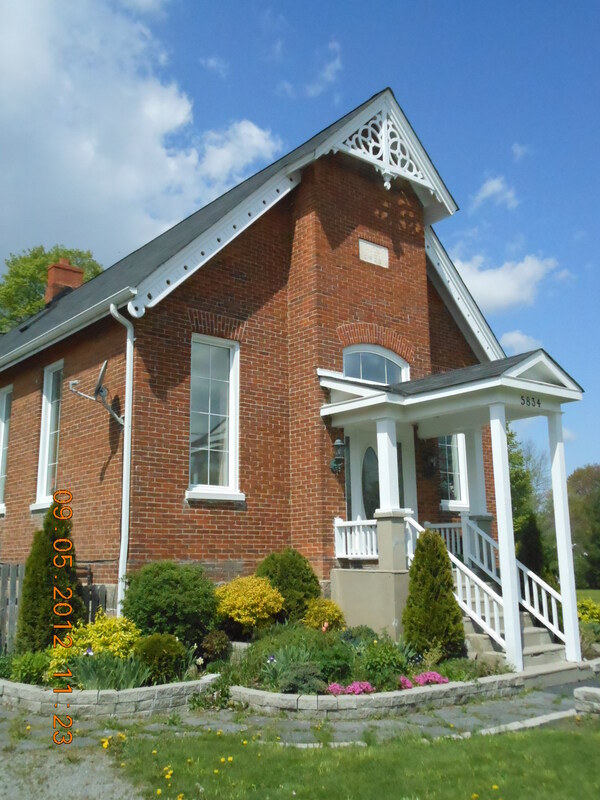 The church is a designated property and the Clarington Heritage Committee will be there with information on the importance of preserving our heritage sites, how the process works and information regarding the work of that group. If you’ve got any questions about your own heritage property or whether your property qualifies, be sure to stop by! The church families have prepared tons of history displays featuring life in the community in days gone by as well as of the history and life of the church. The architecture of the structure reflects the typical rural wood frame and sided church with simple but lovely stained glass windows and lots of woodwork inside. One of the things that makes this site unique is that even when the church is still used twice a year for local services, early in July each year, the only washroom is an Outhouse. The building never had plumbing installed and the congregation had to use the Outhouse and a well when they required water for Church functions. Film Studio/Barn (2012) – This building was originally a film studio, which in the 1970s and 1980s produced films in Ukrainian, Urdu and English. It may be one of the best kept secrets in Mitchell’s Corners. The “ON AIR” sign and some film equipment are evidence of that time. A Kumo Jiu Jitsu school now occupies this site. One movie made in the studio was the 1970 production of “The Proud Rider”. Actors in the film included Art Hindle and members of Canada’s Satan’s Choice. Outside the former Canukr Film studio, the building still maintains the rustic qualities of a barn. But once inside it is hard to believe that it was once occupied by cows and chickens. The first floor of the two-storey building contains 12 rooms- which included work rooms, office, a conference room, a still-photography studio, an editing room and kitchen. The editing room was equipped to handle 16mm and 35 mm work. Also on the first floor was a 30 seat screening theatre with a 9-by-12-foot screen. Behind was a glassed-in projection room. This former barn was once the site of Canukr Film Production Ltd. of Oshawa. Reputed as one of the best-equipped privately owned motion picture studios in Canada, it housed equipment for the production of 16 mm, 35 mm and sound films. In the 1960s and 1970s, Canukr Film Productions under the leadership of Walter Wasik produced films in Ukrainian, Urdu and English. One of the more well-known productions from this film studio is ‘The Proud Rider’ filmed in 1971. Well known Canadian actor Art Hindle, credited as Jeremy Kane in this film, stars as the main character Michael who wants to join the Satan’s Choice bike gang to make some easy money. The film also stars real members of the Satan’s Choice bike gang. The property now houses a Kumo Jiu Jitsu school. Hampton Creamery (2012) – The Hampton Creamery opened its doors for business in 1870 and operated, eventually as Chant’s Creamery, until the 1960s, when the building became a private residence. It was the first cheese factory in the area and local farmers would bring their milk to this creamery to have it made into cream, cheese and butter. The farmers were paid based upon the quantity and quality of the cream produced by their cows. The creamery played a vital function within agricultural society. During years of poor crops, the money earned through selling milk to the creamery became an important income within the farm family. The production of milk was a more stable ‘crop’ than the seeds in the fields that were at the whim of Mother Nature. Today, this building reminds us of its long ago importance in the community with remnants from its days as a creamery. Pulleys that carried cheese up to the attic and freezers in the basement are reminders today of this once thriving business. Also on the property is a sulphur spring near the building that is reputed to have had healing properties. Hampton United Church (2012) – Construction on the Hampton United Church started on May 7, 1874 when the Honourable Senator John Simpson laid the first cornerstone. The property once was the site of a hotel, but that building was relocated across the street and moved North and exists today as a house. The community celebrated the opening of the Church in February with morning, afternoon and evening services, as well as a dinner that cost a total of 75 cents per person! The modern day Hampton United Church is a hub of activity for the village of Hampton. It’s location at the central intersection in Hampton gives the church a prominence which makes it the architectural focal point of the village. Surrounded by mature trees and an iron fence, the church has a particularly fine setting which enhances its Gothic Revival Design. The Christian Education Wing acts as the unofficial community centre and plays hosts to a number of community events like card nights and themed dinners. Judi’s Perennial Garden & Stone House Tour (2012) – Constructed in 1857 of random coursed fieldstone, “Sunnyside” is part of an important grouping of four stone houses along the 7th Concession west of Solina Road. Of the four, it is the best preserved and is arguably the most attractive stone farmhouse in the Township. 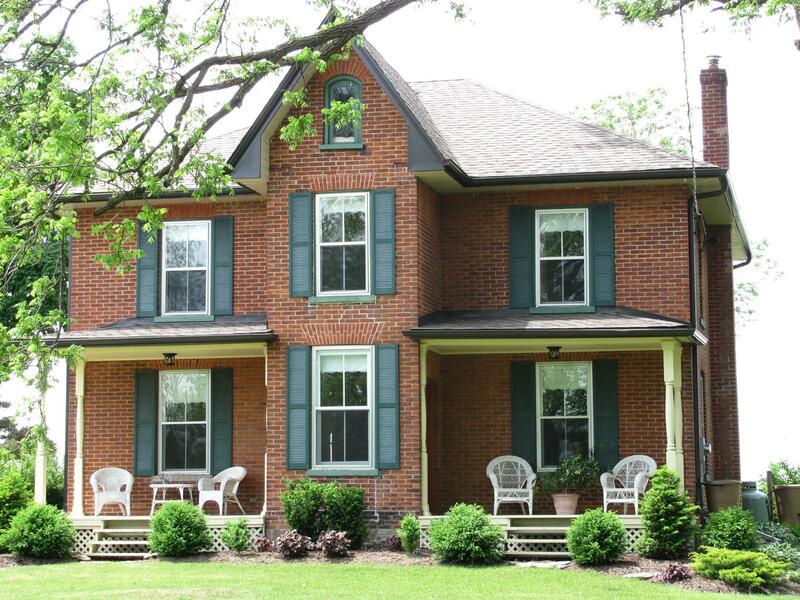 “Sunnyside” or “Stoneleigh” is a very attractive stone farmhouse constructed in 1857 of random coursed fieldstone. 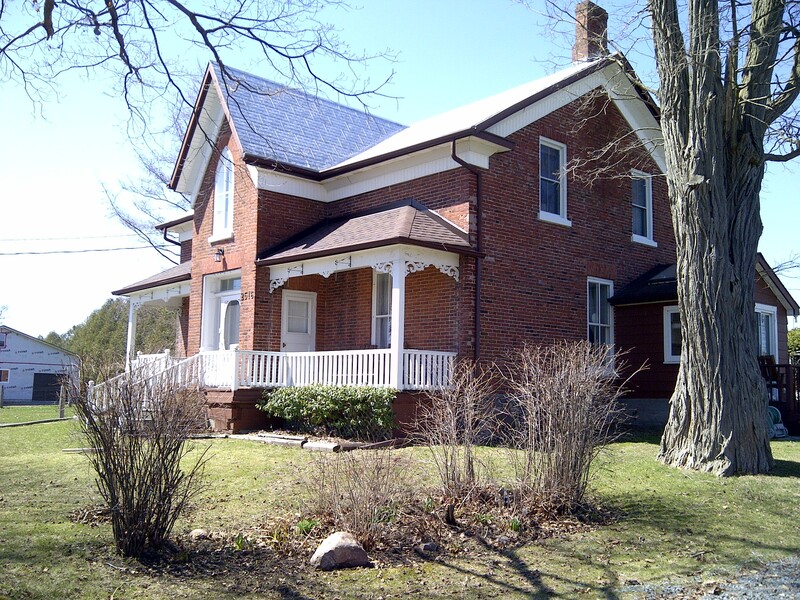 The home is well preserved and designated as a Heritage structure. It retains its six-over-six sash, shutters and returned eaves for the architectural details of interest, as well as transom & sidelights around the front door containing an elegant Regency glazing pattern shaded by the unique trellage verandah with gently curving roof. The added verandah on the east side was designed to carefully match the design of the original. The property bears both names on historic documents. The present owners have a passion for perennial gardens and boast over 100 varies of peonies which should be in full bloom for our event. The gardens also contain hostas and others of interest and are a delight to walk through. Knox Family Home (2012) – Many original features of this enormous frame house, once called “Shangri-la,” on this fourth-generation family farm have been beautifully preserved. This house is believed to have been built for Jordan Van Nest Sr. in the early 1880s to replace a log cabin that stood just south of it. The builder was Harry Gaye Sr., founder of the well-known Gaye Construction Company in Courtice, who spared no expense in its construction and decoration. The house is known for its 11 foot high paneled ceilings, patterned wainscoting, ornately carved door and window frames and ballroom-sized rooms. One of the rooms in the home has seven doorways, each one with an intricately carved wood frame. At one time, a large verandah circled all four sides of the house with gingerbread fretwork. Jordan Van Nest Sr. was kicked to death by a horse in 1892 leaving his wife, Edith Elton with nine young children. One son, Jordon Jr. ran away to the United States at the young age of 16. It is said he spent some time in the Californian gold fields before settling on a farm near Johnstown, Pennsylvania. He never came back. However, “Jordan never forgot his old home. Every detail was ingrained in his memory so clearly that he was able to transmit its picture in story to his children, and their children. And when the grandchildren came at last- in 1969- searching for their old Grandad’s ‘Shangri-La’ (and found it exactly as his stories had painted it, even to the newel post on the staircase) they too were enchanted by this old place”. The Van Nests lived in the house until about 1911. The house had a series of owners and renters until Jean and John Knox purchased it and the accompanying farm in 1945. Four generations later, the Knox family continue to reside in the home. Today, the farm is well known as the Knox Pumpkin Farm. Public tours of their farm offer glimpses into the past including hay wagon rides, country produce and livestock in the old barns. School tours and birthday parties for kids are a unique part of their farm business. Ontario Power Generation – Darlington Nuclear Generating Station (2012) – The four CANDU 935-megawatt reactors at Darlington, on the Lake Ontario shore, have been providing about 20 percent of the electricity Ontario needs since the plant began operations in 1993. Solina Barns Walking Tour (2012) – The early barns in this and similar villages served many purposes. Some very early structures were blacksmith shops, although due to fire were generally replaced by stone structures later on. Many others served as wagon and carriage makers or wheelwrights shops, while others housed livestock. In Solina, there are a variety of barns still standing including the one that will be open for guests to view which was in fact a wheelwright’s shop. The doors are located close to the road which allowed for easy access for customers and workers alike. More typical of barns and driving sheds of this era, doors were located at the back or side so that they were closer to the house. The tour’s main barn, circa 1850 to 1880, is sided in the typical board and batten of that era, and like others in the village has stood the test of time along-side the nineteenth century home which served many purposes as well during its lifetime. “A wheelwright (or wainwright) is a person who builds or repairs wheels. The word is the combination of “wheel” and the archaic word “wright“, which comes from the Old English word “wryhta“, meaning a worker or maker. This occupational name eventually became the English surname Wheelwright. The barn furthest north on Solina Road in the village was a livestock shed with low ceilings. It has been renovated to house a workshop now but the upper loft area is clearly visible from the outside. Solina Community Hall (2012) – The community of Solina has long had a meeting place on this corner of land. It started with the Sons of Temperance Hall in 1881. By 1952, the old building was set up on a new foundation and was called the Solina Community Centre. 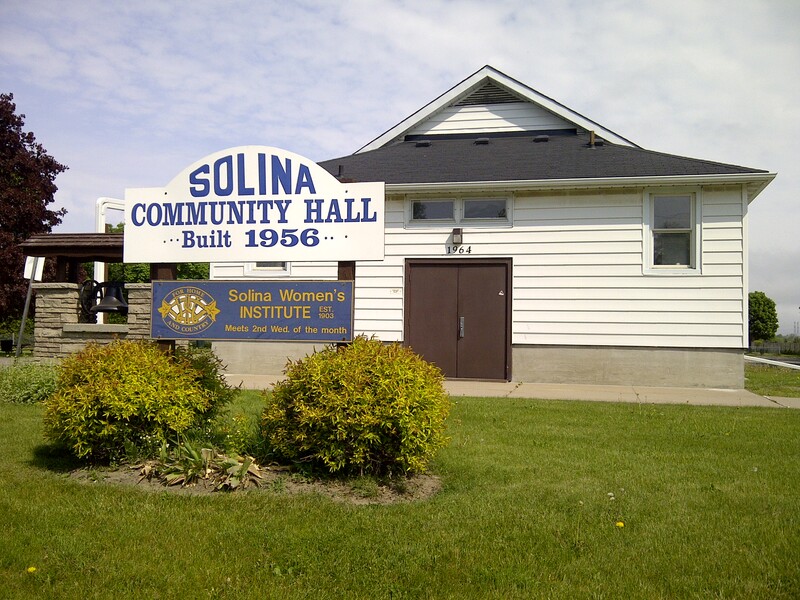 When a fire on the morning of February 4th, 1956 destroyed the community centre, the Solina community rallied to build a new community hall. Opened on October 19th, 1956, the stage and windows featured the only items saved from the fire – the draperies – which were out at the cleaners at the time. Today, this building has a stage, beautiful hardwood floors, an elevator and fully accessible washrooms. The walls feature numerous historical plaques and displays depicting the history of the hall, the village of Solina, the church and the general store. The hall remains at the centre of community life with sports fields and playground surrounding the building. Community events including picnics, banquets, dances, card parties, concerts and weddings are just a few of the many activities held within its walls. Solina Schoolhouse (2012) – This two-room school was built in 1899 using brick brought from Bowmanville. To limit construction costs, community members hauled the stone for the foundation free of charge. In a simplified version of Queen Anne Revival style, the school has been well preserved and retains its decorative bargeboard in the front gable, although the once impressive belfry no longer exists. The window sash are original and the front porch modified at one time dates from circa 1930. Inside the visitor will see the blackboards still on the wall of this tastefully decorated home, with the original wood floor and ceiling panels still in place and restored. In one corner there is a collection of items from the school in days gone by including the water jug stand, books, and desks while in another space off the main room of the school the library area is still as it was when the school closed complete with telephone mounted on the wall. In the basement, visitors will enjoy seeing the scratched initials and names of many former students who when allowed to play there in rainy weather found a hiding place under the stairs to mark their presence. 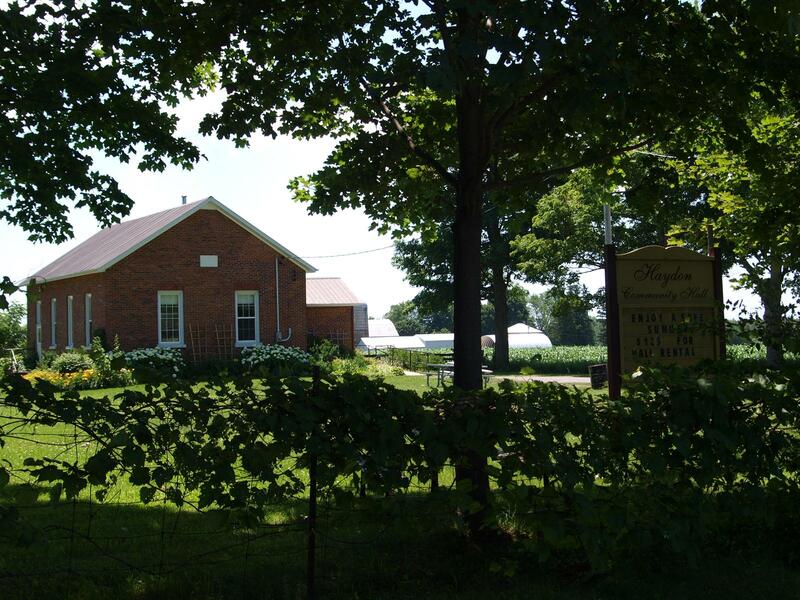 One of the few rural schools remaining in the original Township of Darlington. This one remains in a prominent position on what was the outside of the village at the south end. This is the third school to have existed in the village and the second outline of the second for many years could be seen when the summer sun had dried the grass on this lot but north of where the present school stands. There is a model of the school was created from memory by a student who graduated from the school in 1899. The date stone on the front of the school reads “S.S. No. 20 1898”. One-room schools in the township were closed in 1966, but this school continued to operate for another six years. The school was closed in 1972. Now a private residence, it has the original floor, ceiling and blackboards. Tooley Mill (2012) – Now memorialized with a cairn and historical plaque, the mill, known affectionately as the People’s Mill, operated using the water power from Farewell Creek and Black’s Creek. 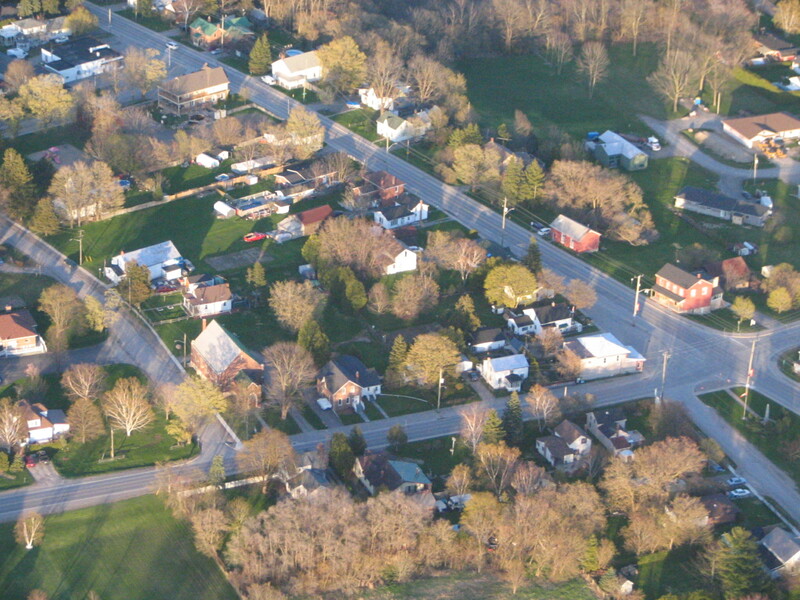 Just to the west of Courtice was a neighbouring hamlet called Prestonvale (today part of Courtice). It was once called Black’s Hill and in 1825 was the site of the first post office in Darlington Township located just East of today’s Preston Pub. The postmaster was none other than Colonel James Black, the originator of the name. It was also later called Tooley’s Hill after Augustus Tooley who ran the grist mill at Kingston Road where Farewell Creek crosses underneath Highway 2. Today this is the present location across the road from the Tim Horton’s. After the War of 1812 the first post office was set up at Black’s Hill (later called Prestonvale) by Colonel James Potter. It serviced the immigrants in the Courtice area as well. The first mail carrier was William Mulligan, who did deliveries in the area with the aid of his mule. Mulligan’s mule lived until 1863. “The cairn and plaque were built from the stones of the foundation of the Augustus Tooley’s house, the miller who once lived on the property. 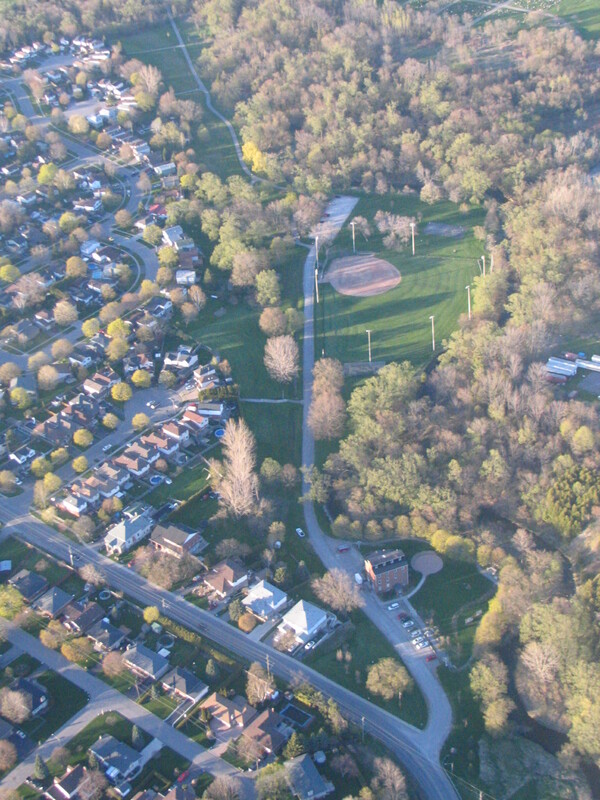 The long history of this Courtice park began in 1874, when Jacob Stalter built a mill there. He dismantled the 100-foot-long timbers of white pine from his original mill in Haydon, Ontario and re-used them for the mill in Courtice. Augustus S. Tooley acquired the mill and some nearby land from Mr. Stalter in the late 1800s and the area became known as Tooley’s Mill Hill. The mill, known affectionately as the People’s Mill, operated using the water power from Farewell Creek and Black’s Creek. Mr. Tooley planted willow trees around the mill pond as soon as he had acquired the mill and advocated their benefits in protecting a waterway under flood conditions. During a flood one June when every other mill pond in the area burst, Tooley’s Mill remained unharmed due to the willow trees that remain today, according to Ms. Rutherford Conrad. Kendal Ponds (2011) – The Ontario government acquired this 862-acre (349-hectare) property on the Oak Ridges Moraine through purchases and appropriations, beginning in 1966, with the intent of creating a greenbelt near the growing Toronto metropolis. A group of local citizens maintains this beautiful site with its hiking trails, streams and fish ponds. 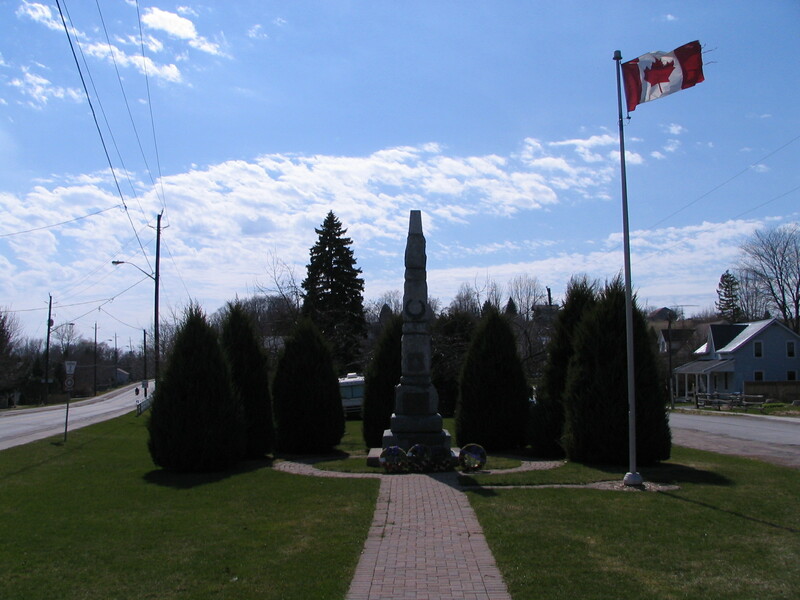 Newtonville Cenotaph (2011) – The cenotaph, built in 1904 to commemorate Captain William P.K. Milligan who died in the Boer War, was originally in the middle of the intersection. It was moved to its present – and safer – location in 1943. The local Women’s Institute helped to preserve the monument and have the names of Second World War soldiers from Newtonville added to it. 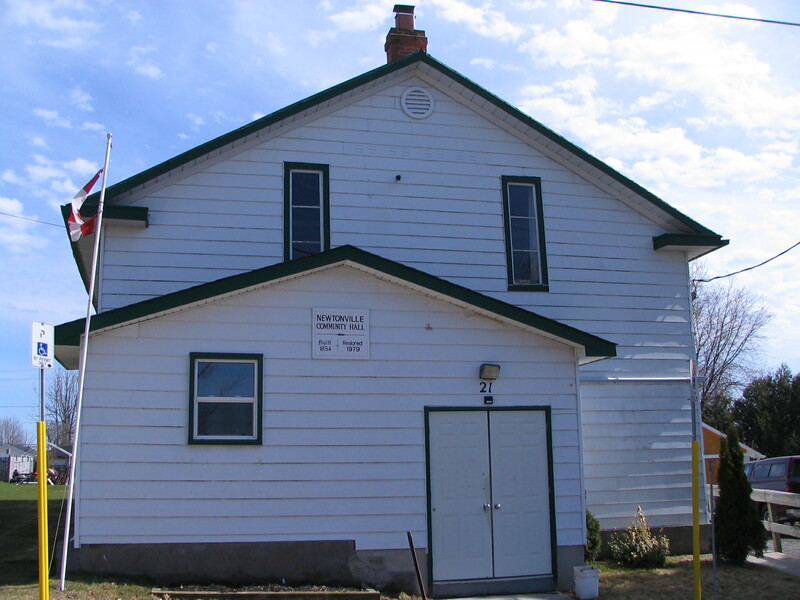 Newtonville Community Hall (2011) – This hall was built as the Royal Templars Lodge in 1854. The Royal Templars was one of many temperance societies popular at the time. The monthly meetings of this social organization included plays, songs, readings and music. The building was restored in 1979 as the local community hall. Historical photographs of the village are on display here. Stapleton/Grist Mill Auctions (2011) – The main building on this site is the old British American Garage, built in the 1950s to replace the original Burley Garage of the 1920s. 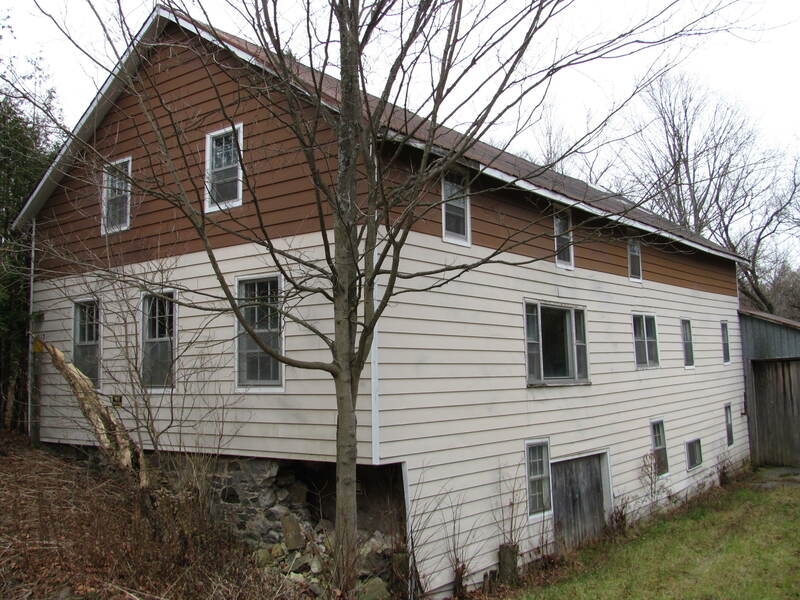 The other is the grist mill, which in the early 1900s was a blacksmith shop. Rebuilt after a fire in 1943, it features a vintage Ruston & Hornsby diesel engine. 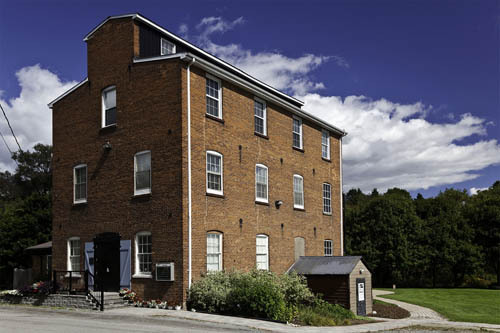 Newtonville Self-Guided Walking Tour (2011) – Walk through historic Newtonville and learn about the village’s interesting past. Visitors can pick up their brochures for the Newtonville Cenotaph. Jones House (2011) – This large home has dominated the main intersection of Newtonville since its construction in 1858. 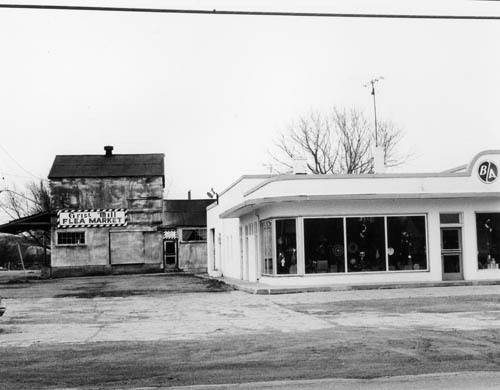 Three generations of the Jones family lived and operated businesses out of this building. Samuel Jones Sr. built it as a hotel. His son Samuel Jr. ran a grocery store from here from 1887 to 1897. Samuel’s brother George W. Jones then operated it as the new “Temperance Hotel”. He was also the founder and manager of the Port Hope Telephone Company which operated from these premises. On his death in 1929 his son, C. Melville Jones, took over leadership of the Telephone Company. This independent telephone company was purchased by Bell in 1968. George W. Jones also operated a photography business from this building from 1889 to 1899. At that time the roof boasted a large skylight to take advantage of natural sunlight for his photographic portraits. Kendal Orange Lodge (2011, 2017) – In 1870 a parcel of land was purchased from Theron Dickey for the price of $50 for the purpose of a New Connexion Methodist Church. 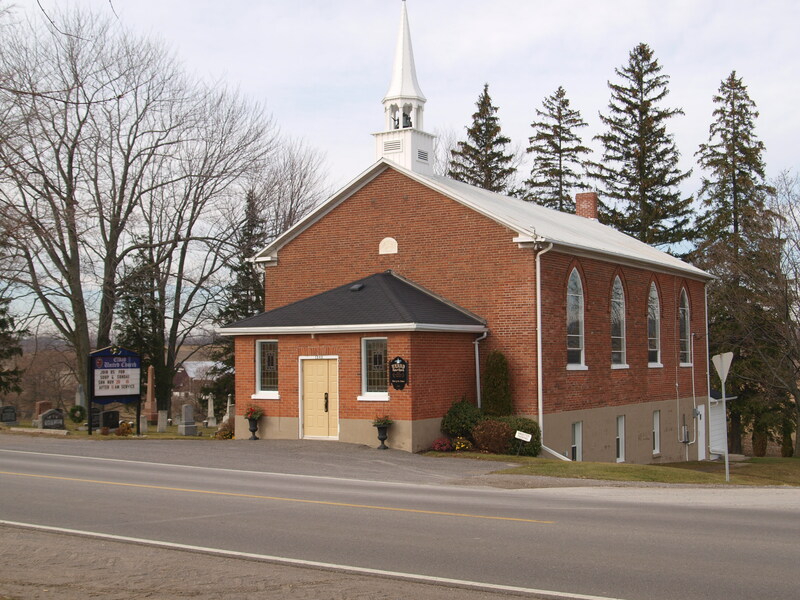 The church was registered in the Township of Clarke on the 11th day of May 1874 with trustees Thomas Stanton, shoemaker and John Lyness, carpenter. On February 10, 1881, the Church was sold to the Kendal Loyal Orange Lodge No. 915 for the sum of $200. In 1927, Enniskillen Orange Lodge Hall, which was located north-east of Kendal, was moved to the village and half of it was added to the existing hall. Today this portion of the building is the present day stage. The other half of that building was added to the United Church across the street, and is now the Sunday School room. The move was made possible by the efforts of both Lodges and interested citizens of Kendal. There was originally a balcony above the entrance to the hall, which has since been covered in and is where the furnace now sits. In 2005 a project was undertaken by the members of the lodge during which the floor of the stage was removed and a new floor was constructed, level with the floor of the main hall. Bathrooms and a kitchen were built on the new floor and for the first time Kendal Hall was equipped with running water. A platform was constructed at the front of the main hall for the Master’s chair to sit upon and it was constructed using wood recovered from the original stage floor and walls. After major renovations in 2005, the building had running water for the very first time. 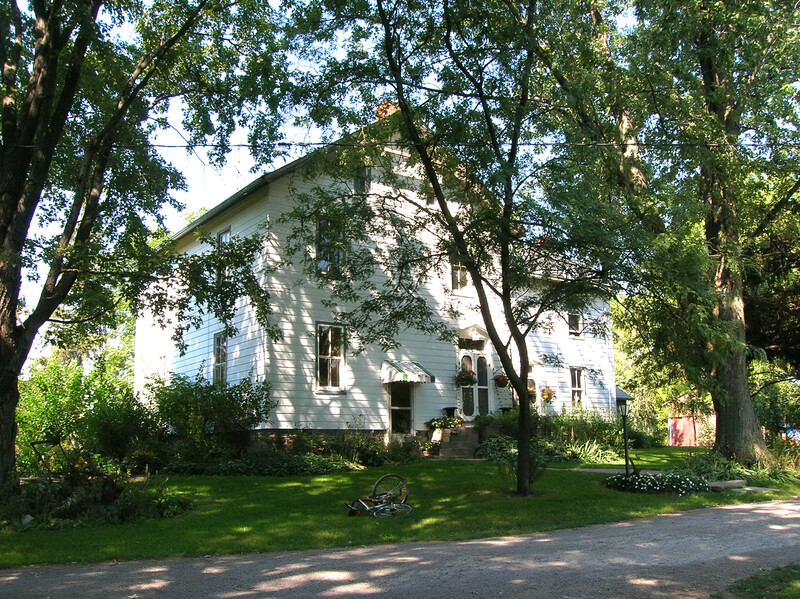 Mulder House (2011) – This was the home of Daniel Comstock who operated a sawmill and flour mill at the west end of the village. The High Victorian architecture with decorative buff brick features is in excellent condition. During the 1960s, the home was modified for use as a summer camp for boys and girls with dorm rooms and a play room with pool table. Today, the home has been restored as a private residence. 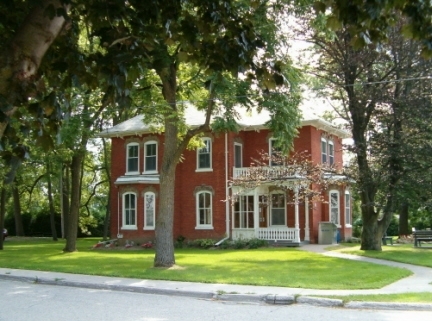 Clarington Public Library – Orono Branch (2011) – This large red brick house was once the home of John Waddell, built in 1882. It has been the Orono Public Library since 1969. A solid, but not elaborately decorated house, its windows boast scrolled decorative labels at their tops. Waddell was a leading businessman in the community whose interests included the North American Hotel, Orono Furniture factory and the Orono Cheese factory. 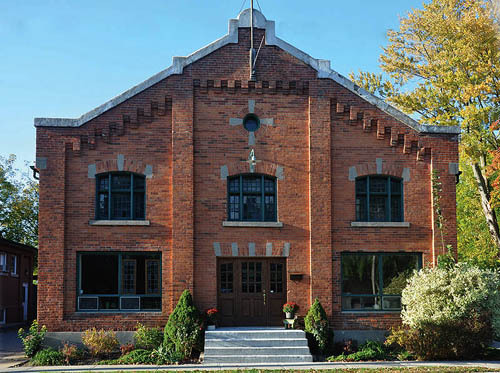 Orono Armouries (2011) – The Orono Armouries was opened in 1913 by Adjutant General V.A.S. Williams. From 1915 to 1954, the building was used for military practices. It has also served as a school gymnasium and dance studio. Many of the original interior fittings remain, including the firing range in the basement. Today, the building has found a new life as the Orono Antiques Market. 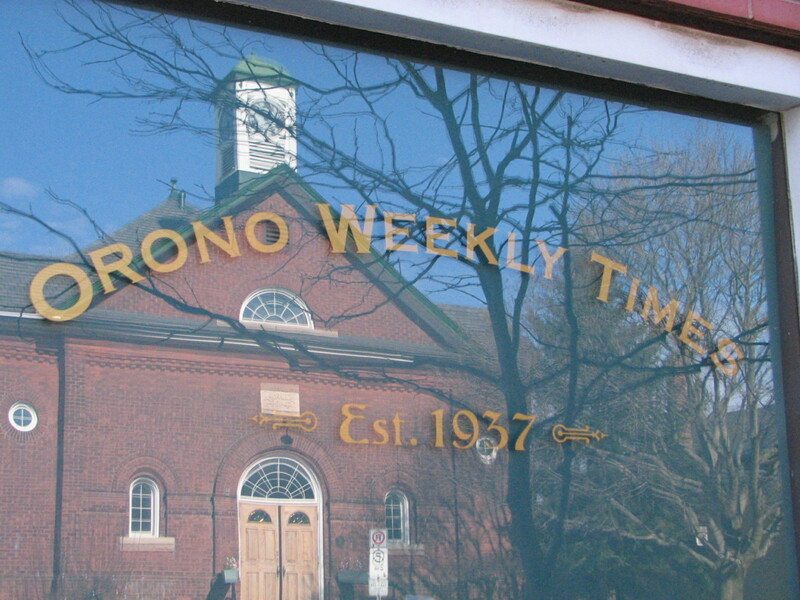 Orono Weekly Times (2011) – Newspaper publishing in Orono dates back to the 1850’s. In 1856 Ebenezer Thorne began printing the “Orono Sun”. This was a weekly four page paper that covered a wide area. It’s sub-title was, “Newcastle Garland” and “Clarke and Manvers Advertiser”. Mr. Thorne also printed a temperance paper called the “Canadian Visitor” and the “Day Dawn” for the Bible Christian Church. In 1935 the “Orono News” was purchased by M.A. James and Sons in Bowmanville. They are the same James Family who successfully ran the Bowmanville Statesman newspaper from 1878 to 2000. The “Orono News” ceased publication in 1936. A year later, to fill this void, Roy A. Forrester began the “Orono Weekly Times”. Since 1937, the Orono Weekly Times has operated out of the same historic red-brick building in downtown Orono. His son, Roy C. Forrester carried on the newspaper for many years. He was heavily involved in many community organizations and projects and is still fondly remembered by local citizens. His contributions to Orono and newspaper publishing is recognized by a bronze plaque on the exterior of the Orono Weekly Times building today. In 1995 Troy Young purchased the newspaper. Marg Zwart purchased the newspaper in 1997 and under her guidance continues to publish this newspaper each week. Bowmanville Zoo (2011) – Bowmanville Zoo began as part of the Cream of Barley Tourist Park, which also had tourist cabins and a swimming pool. Today, animals from the zoo are featured in Hollywood films. As the oldest private zoo in North America, the Zoo has established itself as an important voice in conservational education and the promotion of viable captive populations of endangered animals. Maintaining the largest stable of trained animals in North America, Bowmanville Zoo has become a leading supplier of animal talent to the television, movie and entertainment industry. While concentrating upon the large feline predators and elephants, Bowmanville Zoologocal Park has enjoyed great success with a wide array of mammalian, reptilian and avian species. While the development of appropriate animals for the feature film and television market remains one of the major activities of the zoo, it is a smaller part of the principal ongoing efforts to educate and instil stewardship ethics of our planet in visitors to the zoo. Visual Arts Centre of Clarington (2011) – This red-brick building, now an arts centre, was built after the original wooden mill on the site burned down. The busy mill, powered by water from Soper Creek, was known as the Cream of Barley Mill. Cream of Barley was once a breakfast mainstay. The arts centre has three floors dedicated to exhibitions, workshops and studios. Soper Creek Trail (2011) – This trail runs alongside Soper Creek and was opened in 1999 by Valleys 2000. 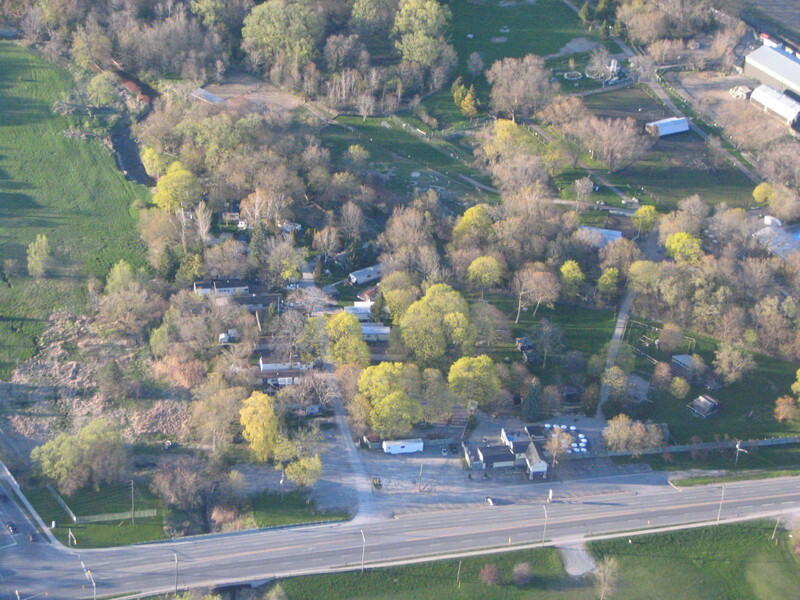 Soper Creek is named after the Soper family, which owned large portions of land in both Darlington and Clarke Townships. The Soper family were United Empire Loyalists (UEL) that immigrated from Vermont to Hope Township in the late 1700′s. Leonard Soper was a surveyor, justice of the peace and owned a schooner. In 1805 they came to Darlington Township and established the first sawmill in the township, which burned down in 1806. It was rebuilt in 1807 on the site of what is now Soper Creek Park. This mill was the first of many that eventually became the famous Cream of Barley Mill under John MacKay’s ownership. Riss/Riordan House (2011) – The construction date of this gothic-style red brick house is approximated @ 1860. The house has a central gable which is common in gothic architecture. The round headed windows with brick fan mouldings are unusual in the gothic style and demonstrate an Italianate influence. In recent years, the house was vacant and under threat of demolition. Since then this home has been restored as a private residence. Beech Avenue Walking Tour (2010, 2014) – Guided tours of historical Beech Avenue will include Bowmanville’s only gatehouse, the story of the Rathskamory estate and some of this area’s oldest trees. Bowmanville Crematorium (2014) – In 1995, three local funeral directors worked together out of a growing need to create a completely unique cremation facility that has now grown to include 34 independent funeral homes and their clients. Bowmanville Foundry (2014) – Established in 1901, this foundry has a long history of technical innovation and process leadership in manufacturing castings. 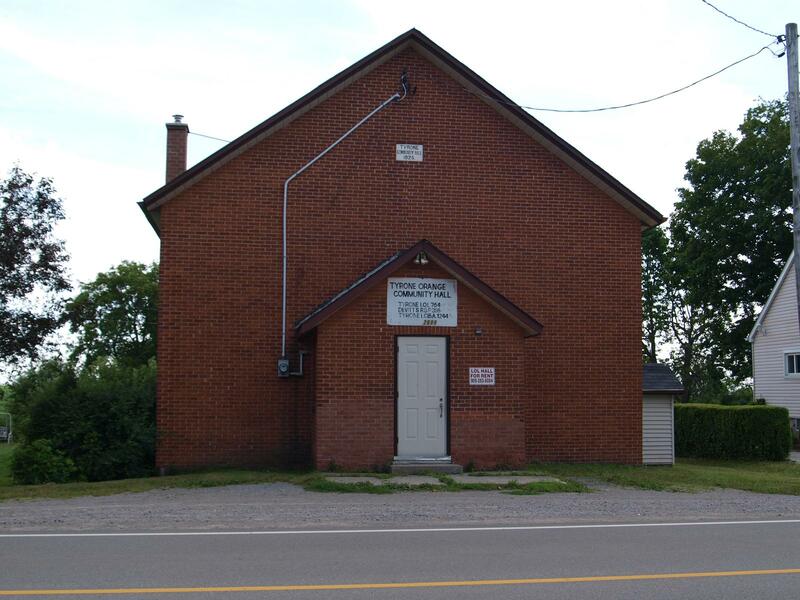 Bowmanville Masonic Lodge (2010, 2014) – The Bowmanville Masonic Lodge was formed in 1848. Since 1905, it has met in the Bleakley Block, the most elaborate of downtown Bowmanville’s King Street commercial blocks. A large ornate wooden door marks the entrance to the hall, which boasts its original furniture, much of it made in Bowmanville at the Upper Canada Furniture Company. Bowmanville Veterinary Clinic (2014) – Established in 1968, this business is Clarington region’s most long-standing practice. The clinic provides medical and surgical care to small and exotic animals as well as the animals at the Bowmanville Zoo. Bowmanville-Westside Marshes Conservation Area (2014) – This unique conservation area includes two provincially significant coastal wetlands. Originally owned by St Mary’s Cement, the land was recently dedicated to the Central Lake Ontario Conservation Authority and has undergone extensive restoration. Central Public School (2014) – This school has been in operation since 1889 and will be celebrating its 125 years through historical displays. Throughout its long history, the school has been the venue for many events, including town baseball games, movies and Lions Club carnivals, and is the marshalling area for the annual Santa Claus parade. Clarington Older Adult Centre (2014) – Originally, this building was Rathskamory House, the stately home of Dr. James McLaughlin, brother of R.S. McLaughlin of General Motors fame. Over the years, it has housed a boy’s training home during the Second World War, a Lions Club and, since 1998, the Clarington Older Adult Association. Some architectural features of the building are original. John McClung-Kuipers House (2014) – In 1858, John McClung built this home as a one-storey house with French doors leading to an encircling veranda. In the 1870s, a second storey was added and veranda removed. In 1884, McClung was forced to sell his beloved homestead to the Trebilcock family. Today, the building is one of Bowmanville’s best preserved and most architecturally interesting buildings. The Octagon House (2014) – The Octagon House was built in 1864 by trustees of the Congregational Church for use as a parsonage. The style was based on Orson Fowler’s theory that the efficient geometry of sides not only was the best use of space, but also promoted good health. Ravenscraig (2014) – This Queen Anne-style residence showcases many architectural details. The houses boasts Arthur Drummond paintings, decorative plasterwork, attic, and even the original carriage house. Royal Canadian Legion Branch 178 (2014) – For 84 years, this branch has been active in the community, supporting members, veterans and their families. Many architectural details of the original structure, a private home built in 1878, remain. St. Marys Cement (2011, 2014) – St. Marys Cement, a leading manufacturer of cement and related construction products, has long been a landmark along Highway 401. 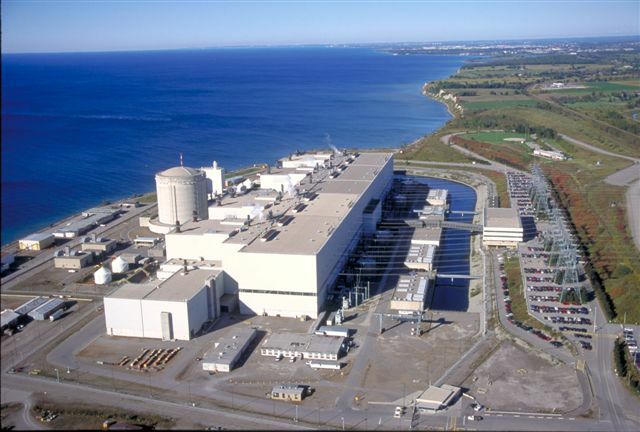 Participating in many landmark Ontario projects – including the CN Tower, Roy Thomson Hall, Maple Leaf Gardens and the Darlington Nuclear Station. Valleys 2000 Fish Passage (2014) – The fish passage at the old Goodyear dam was known to be inadequate for transferring larger fish upstream to spawn. In 2010, the Central Lake Ontario Conservation Authority formally proposed that Valleys 2000 spearhead fundraising for a new fish passage, which is now completed. Come and see the facility, and enjoy the walking trails. Waltham Cottage (2014) – Built in 1856, this cottage is one of Ontario’s most attractive Regency dwellings and is part of an important grouping of 19th-century houses. With its high basement, shallow hipped roof and unadorned cornice, it has an exceptionally low profile. For many years, the cottage was a finishing school for girls. Today, it is a private residence. West Beach and Cottages (2014) – West Beach Harbour was built in 1839 and was a tent community before the cottages were built. The majority of them were constructed before the First World War. They are between 80 and 100 years old. There are still seven remaining cottages, and you can take a stroll down the new replica of the boardwalk. From humble beginnings in 1937, Brimacombe has grown into one of Southern Ontario’s largest ski areas. In 2017, Brimacombe celebrated it’s 80th season in operation with unique displays and exhibits. Since 1961, fans have been watching car races here at the former Mosport International Raceway, one of Clarington’s most famous attractions. Throughout its colourful and varied history, it has hosted Formula 1, IndyCar, NASCAR and other events. Doors Open Clarington visited the ultra-modern Events Centre, which provides excellent panoramic views of the course, including the start/finish straight, the pit road and multiple corners. Wilfred Hawke was neither a pilot nor an airplane owner when he had a private landing strip built on his farm in the mid-1950s. Friends and strangers were welcome to land here and tie down along the runway, lengthened in 1989 to it’s current length of 3,300 feet (1,006 metres). This rehabilitated gravel pit is now the site of an annual barnyard fly-in on the Sunday following Labour Day. See Second World War era aircraft and see one of Clarington’s finest private airstrips. As a Retro Executive Home, this is a different kind of “Bee & Bee”, offering single room and full house rentals on a daily, weekly or monthly basis. Located in idyllic Leskard and nestled into eighteen acres of dedicated conservation forest. The house can be adapted to suit numerous purposes, sleeping up to 16 people in beds. There has been a school in Kirby since 1836. The first building was a log structure just southwest from the present school. In 1857 a new larger frame school was built and it was incorporated into the current building in 1878. The school is notable for its original interior which includes an ornate tin ceiling made by the Pedlar People Company of Oshawa, Ontario. The blackboards are original as are two of the desks. The outside bell predates the cupola and is said to be the original one for this school. Typical of many schools it, at one time, had separate entrances for boys and girls. Where the centre door is today was once the cloak room. Regular classes ceased in 1970, but kindergarten classes were held here until 1976. In 1980 it became home of the Clarke Museum and Archives. 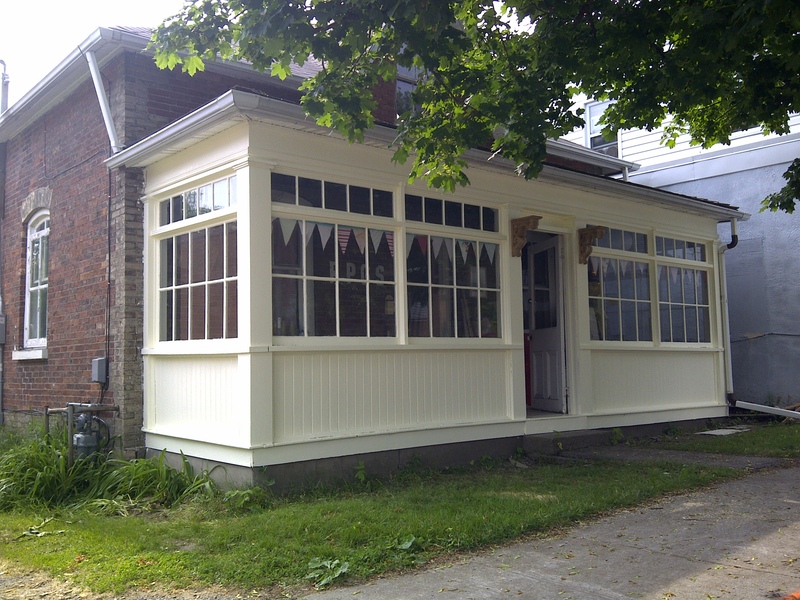 This building is now part of Clarington Museums offering educational programs for local schools and community events year round including the Pumpkin Bee in the fall. Making it’s second appearance on Doors Open Clarington (2011), this brick church opened just north of an earlier frame church on November 21, 1880. Although it has been modified slightly, the Kirby Church remains true to its original architectural style and is decorated with quoins and hood surrounds. The steeply pitched roof and the simple lancet windows reflect the Gothic revival style. The church plays host to a weekly book sale in the Summer. Mr. Lawrence was a prominent minister in this area. He preached at a little church that opened on August 8, 1852. It was a small frame building; no part remains today. The site is still enclosed, and a few head stones of the congregation remain. There will be a display of the history of the church and remaining stones. A small abandon cemetary with at least 5 graves. The cemetary is the resting place of Leskard pioneer William Nay and his family. Also buried here is one of the sons of the Staples family; another local pioneer name. These stones date back to the mid 1800’s. 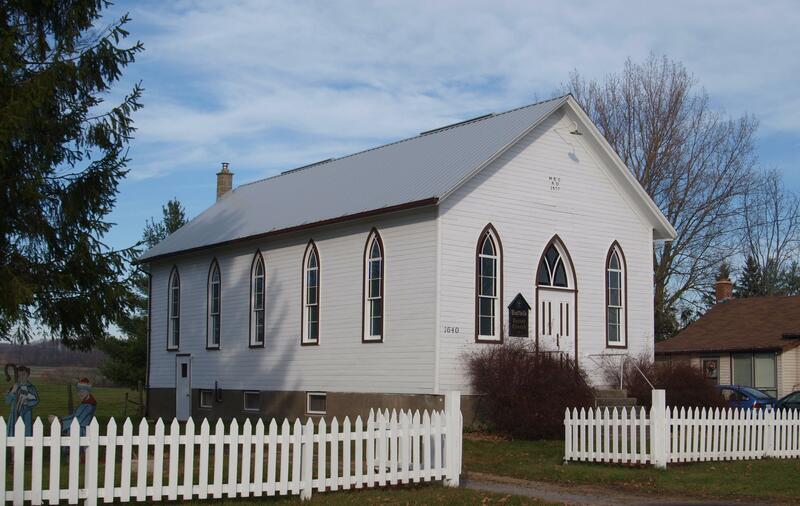 This heritage Church (c.1850) is nestled in a commemorative forest in historic Leskard. Explore its revitalized life as AYUS enabling experiences that support individual development and connections for a community of people interested in growth and well-being. With the vision to inspire, encourage awareness and motivate, workshops, retreats and events are held in side-by-side buildings at the former church and the Hive Bed and Breakfast. See the last remnants of the old sawmill foundation amidst lovely gardens and grounds along the creeks and ponds. One of the two mill sites that offered services in days gone by. The foundation from the old sawmill acts as a small waterfall along the creek. This property was a two-room school in 1872, with separate entrances for girls and boys, and an outhouse. Herman Snyder bought the building in 1967 and sold it to his daughter in 1994. Three years later, fire destroyed the top floor. Extensive restoration work has been done to the house, including restoring the belfry to the original dimensions. Take a hike on this self guided groomed walking trail that is approximately 2.5 kilometres long. Picture perfect natural beauty along this peaceful trail. The trail is part of the Oak Ridges Moraine Trail. The Oak Ridges Moraine Trail has 275km of trails, from Warkworth and Castleton in the east, to the Mono and the Bruce Trail in the west. The present owners purchased this historical property in 1999. The only remaining original features are the stone fireplace and chimney. 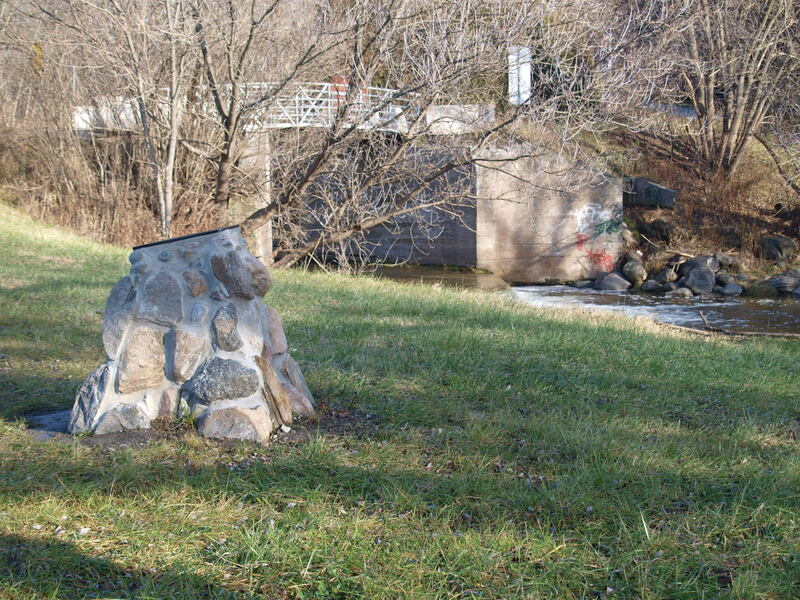 In 1950, a local farmer created the beautiful natural setting, which is linked to Wilmot Creek. ADRA Canada’s mission is empowering communities and changing lives. Each year our international community development and emergency relief projects help hundreds of thousands of people to lift themselves out of poverty and recover after disasters. Previously located in Oshawa, we moved to Newcastle in 2013 after renovating a former seniors’ daycare centre. Old fire hall (repurposed garage) used since 1974 replaced with state of the art facility opening spring 2014 with six-bays & 12,400 square feet. It houses two pumper trucks, aerial device and tanker; bi-fold doors that open sideways. A second-storey bay door allows rope training. Come explore; find out what the pre-alert system is that gives firefighters “30-second head start”. The first home destroyed by fire in 1898 was reconstructed on the original foundation; built by Major S.S. Wilmot c.1814. The cellar still contains several large rooms separated by brick arches and the spring where Samuel Wilmot began his experiments in 1860. The first fish hatchery in Canada was on this property; marked in 1967 with a provincial plaque. 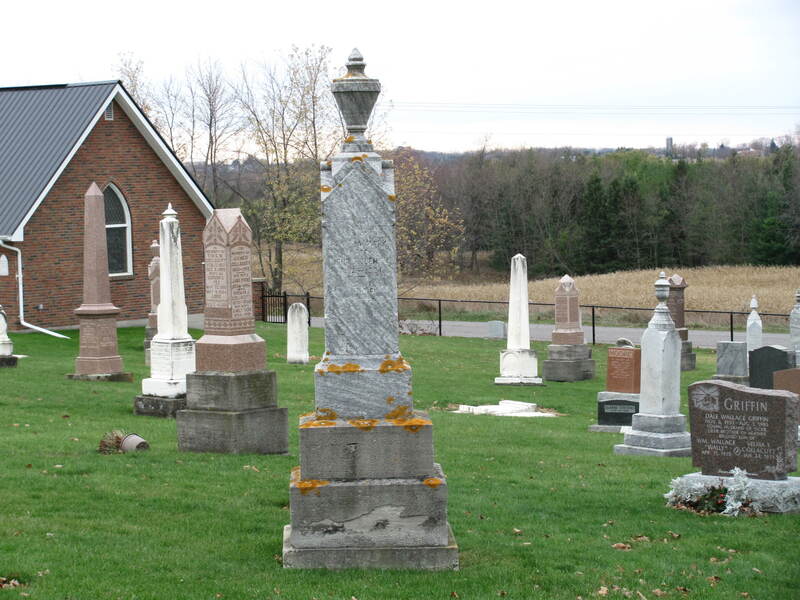 This cemetery was originally established by St. George’s Anglican Church in 1857 on approximately three acres of land. The Municipality took over the cemetery in 1972. The history of the people buried here is overwhelming. From well known ship Captains to “not to be missed” raised family plots holding many generations of those who founded and helped create the town. 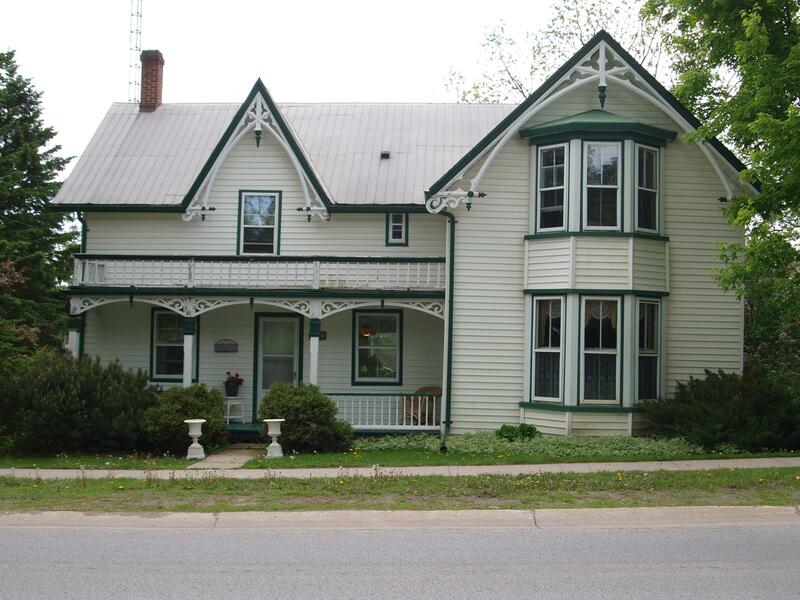 This home was built around 1888 for Dr. Alfred Farncomb. Born in 1859, he was the first pupil to graduate from Trinity College School in Port Hope to become a doctor. He opened his Newcastle practice in 1883 specializing in diseases of women and children. The house exemplifies the Italianate style and has been restored back to original. Durham Masonic Lodge has served the Newcastle area since its inception in 1846. It is believed to have originated in Bond Head and then moved to several locations in Newcastle. It finally took up residence as one of the charter tenants of Newcastle Town Hall at its completion in 1923. The Lodge rooms have been in continuous use since that time. Located inside the Newcastle Community Hall. One of Clarington’s most stately manors, this Newcastle house has recently been restored to its original Victorian splendour. It was built in the 1860s for Frederick Farncomb, who, with his business partner, James Robson, ran an important shipping business at Bond Head harbour. The house contains many of the Farncomb family’s original furnishings. Daniel Massey’s original factory was Canada’s largest agricultural equipment business. Closed in 1879, it sat vacant until 1916 when James Anderson Smith purchased it to build wooden ammunition cases for the First World War. The building, later used to produce wooden jewelry and silverware cases, closed in 1990. Starting in 2004, the building has been converted for new residential/commercial use. Built in 1923 as a gift to the Village of Newcastle from Chester Massey of Massey-Harris fame, this hall is the largest public building in Clarington dating from that period. Now used for a variety of events, the hall contains many interesting features, including original wood panelling, the Massey portraits and a bowling alley. The Newcastle Village and District Historical Society was founded in 1981. Its primary objectives, then and now, are to collect and preserve articles, photos, documents and all other objects of historical significance to Newcastle and District, and to promote public interest in the history of Newcastle and environs and to engage in continued historical research. 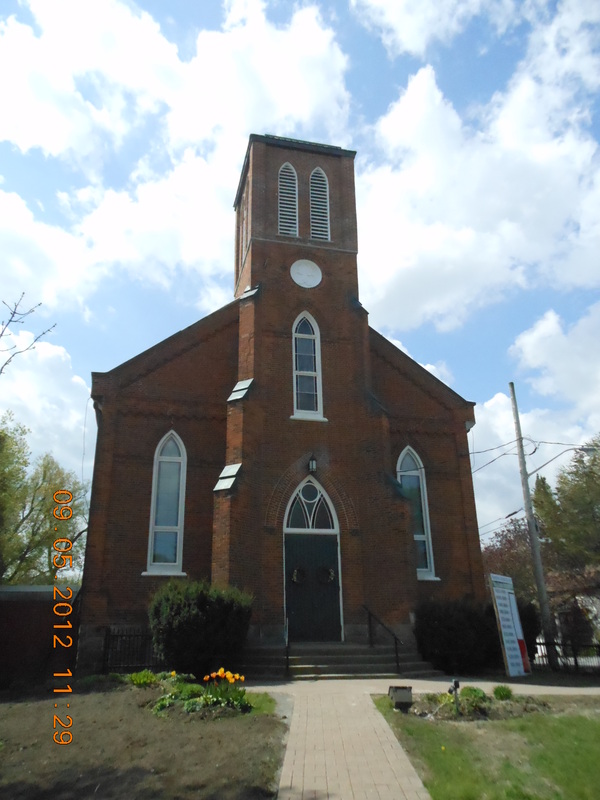 This beautiful church, originally Methodist, built 1867, was completed and equipped at a cost of $6000. In 1893 a new brick hall opened, and a 1909 renovation of the interior followed with financial assistance from the Massey family. Memorial stained glass windows were placed between 1965 and 1976. A new 3 manual Allan organ was installed 1999. This home was built circa 1856 by Richard Varcoe, who operated a licensed tavern in the village and lived here until 1914. The Blackburn family lived here for many years and after they sold it, the house was converted to apartments. The present owner did extensive restoration work and brought the home back to its original condition as a single family dwelling. Work began on the front, side and rear gardens in the Spring of 2011. 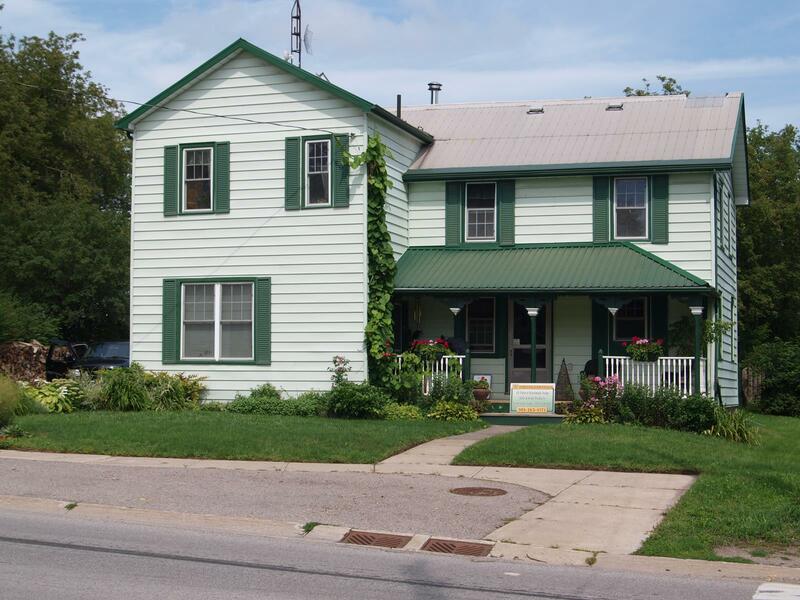 In 2013, the front and side gardens earned first place for Ward 4 in the Clarington Blooms contest. Again, in 2015, the front and side gardens won top recognition in the Clarington Blooms event. Welcome to 2016, and enjoy the gardens now fully matured! Cornerstone laid July 2, 1857. A fine example of classic Gothic church architecture with a hint of English country parish charm. Late 1890’s, Sunday School was added as a parish hall west of the church. The last structural renovation, early 1900’s (around the altar): a vestry, brick boundary walls, sidewalks, two beautiful Tiffany of New York windows at each end of the church. The house built by Asa Walbridge, around 1820, has survived fire, a 1950’s modernization, squatters and attempts to demolish it by a developer. Now nearing completion, see original hand-sawn beams, flooring and windows, stone foundation, original bricks made from Newcastle clay, and photos of the restoration process. At Dare 2 Dream Farm, the main focus is knowing where our food comes from. As the home of Sweet Dream Food, they are local producers of Canada’s natural sweeteners: honey and maple syrup. They also provide interactive farm tours, which include a chance to tour a beehive! Come and experience some of the wonders that nature has to offer. The Ganaraska Wind Farm, a 17.6-megawatt wind energy project, commenced operations in May 2016. The project consists of nine turbines located near Orono. This park was donated by Abraham and Mary Ellen Jackson in memory of their 24-year-old son who was killed in action during the First World War Battle of Iwuy. A commemorative archway and two gates were erected at the park’s entrance in June 1926. For over 80 years, the park has been a local and provincial site for community events. This building functioned as a schoolhouse from 1965-99, and then a group of local women decided it should be converted into a community centre. It now serves as the heart of the community for special events such as weddings and dances. View displays about many aspects of village life years ago including tobacco, baseball, forestry, ponds and waterways. The Ontario government acquired this 349-hectare (862-acre) property on the Oak Ridges Moraine in 1966, intent on creating a greenbelt area near Toronto. Now, the land is designated a crown land management area. Local citizens maintain this beautiful site with its groomed hiking trails, streams and fish ponds. During Doors Open, there will be family-friendly activities and demonstrations. Once a booming industry, tobacco production is now a shell of what it used to be. Each kiln held 1,200 sticks of tied tobacco. Curing was a painstaking process. The temperature and humidity conditions inside a kiln had to be just right. Since Doors Open Clarington, the kilns have been dismantled and recycled to preserve the old materials used to build these structures. With the formation of the United Church of Canada, the Kendal Methodist Church (1870) transitioned to become Kendal United in 1925. With four beautiful memorial windows on the south side of the church and historical ties to both the original New Connexion Church (1869) and the Enniskillen Orange Lodge, this church is a must-see. Kendal (originally called Watertown Mills) is a quiet little hamlet with an amazing yet forgotten history. Explore it on a guided walk-about while hearing about the life of the area’s pioneer families, many of whose ancestors still live here. Envision a bustling village built around the commerce of five mills and learn more about life in the early- to mid-1800s. This cemetery is situated on a steep hill and has an original wrought-iron gate adorned with a cross in the centre. The earliest burial was made in January 1861; it is believed that there are 50 burials. On the north side is a unique family burial plot that was once fenced in and separated from the other plots. In 1845, the present stone home was erected for Alexander Marr by a Scottish stone mason who immigrated to Canada to work on the Rideau Canal. Note that the original limestone mantels and lintels were originally ship ballast on a schooner into Kingston. The Grange was the homestead of the Elliott family (early settlers) from 1859-1969. Additions to the house are visible today (beautiful interiors, a dumbwaiter and a windmill). Also on the property is a mid-1800s-era barn, as well as old granaries, wooden mangers for the draft horses, and two beautiful wooden silos. The authors of the fiction/adventure series Rise of the Prince also operate ThinkBFAB Inspirational Centre. The centre’s peaceful surroundings are an ideal setting for people to practise mindfulness, live in the moment and discover who they really are – amidst two hectares (five acres) of beautiful Ganaraska Forest. See the guest cottage and try making pizza in a wood-burning outdoor oven.